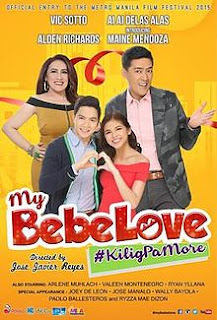 My Bebe Love: #KiligPaMore is a 2015 Filipino romantic comedy film directed by Jose Javier Reyes, starring Ai-Ai de las Alas and Vic Sotto with Alden Richards and Maine Mendoza. It is an official entry to the 2015 Metro Manila Film Festival produced by Octo Arts Films, M-Zet Productions, APT Entertainment, GMA Films, and MEDA Productions. The film follows the love–hate relationship story between Vito Carillo (played by Sotto) and Corazon Talatala (played by delas Alas) and the growing relationship between star-crossed lovers Dondi Talatala (played by Richards) and Anna Carillo (played by Mendoza). 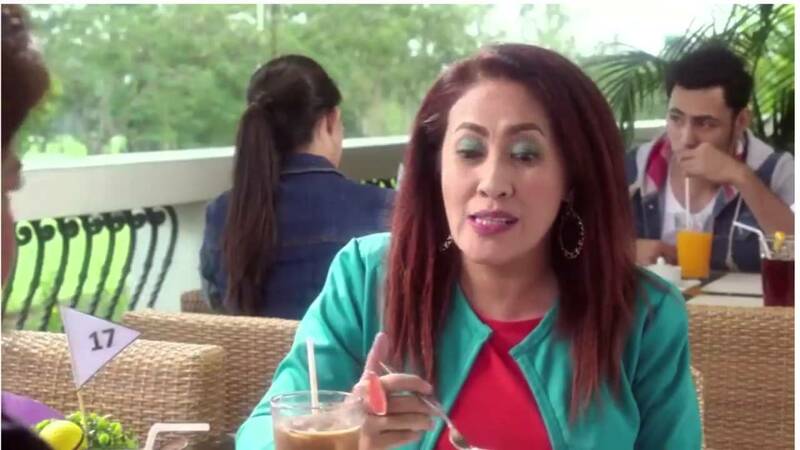 Aside from being the first film of the love team of Richards and Mendoza (collectively known as AlDub), My Bebe Love is the reunion film between delas Alas and Sotto after Enteng ng Ina Mo, which also was an MMFF entry in 2011. It is the first film co-produced under delas Alas's production company MEDA Productions. The film was shown internationally in selected cinemas in San Francisco and Los Angeles in the United States, Melbourne and Sydney in Australia, and Abu Dhabi and Dubai in the United Arab Emirates. My Bebe Love formerly holds the record for the highest opening day gross in Philippine cinema with ₱60.4 million until it was surpassed by The Super Parental Guardians with ₱75 million; it grossed ₱385 million nationwide. During the awards night of the MMFF, the film placed third for the Best Picture category, and received the Gatpuno Antonio J. Villegas Cultural Award; and Mendoza won Best Supporting Actress. Dondi (Alden Richards) is a nerd and an obedient nephew to his aunt Cora (Ai-Ai delas Alas) who makes decisions for him. Meanwhile, Anna (Maine Mendoza) is a stubborn and rebellious girl who seeks the attention of her father Vito (Vic Sotto) who is a widower. Dondi and Anna cross path and their different personalities collide. They eventually fall in love with each other and solve their own problems. Vito and Cora are bitter business competitors and because of their rivalry, they disapprove the romantic relationship between Dondi and Anna. As their rivalry continues, Vito and Cora are caught up in a romance and this time, Dondi and Anna are the ones who disapprove of their relationship. Anna in particular strongly expresses her disagreement with the developing relationship between her father and Cora. She states that her departed mother was more beautiful than Cora. In the end, after they saw Vito and Cora being depressed because of their separation, Dondi and Anna set up a surprise party for their reunion and even inviting Aegis, close friends and business partners of Vito. After Vito and Cora were reunited and all seems well, Dondi and Anna almost kiss but was interrupted by a heart wipe transition leaving up to speculation to the audience if they were able to kiss at all. At the post-credit scene, Lola Nidora (a character in Kalyeserye) appears and urged the audience to wait for a "part two", presumably of the film. Business rivals Vito and Cora want to prevent his daughter Anna and her nephew Dondi from falling in love. Destiny intervenes with their lives in the right time. Good stress reliever for a hard working person. It is perfect for the whole family to watch this holiday season. This movie does not limit audience, it caters all ages. I love the story line and there is no dull scene in these movie. The comedy has just the right blend with perfect timing. You will laugh from the start to finish. So refreshing from what we used to see from these lovely couple - AlDub. I recommend everyone to watch this movie. I love this movie because is not trying hard when it comes to comedy. Unlike the other movies, it focuses on how to make people happy. Good job everyone and I'm so happy about the outcome of the movie.